Kansas-Nebraska Southern Baptists observe the KNCSB Associational and State Missions emphasis in the fall. The 2018-2019 offering goal is $210,000. Half of the money received will go back to the association where it was given. The offering is collected year around — the offering year runs Sept. 1, 2018, through Aug. 31, 2019. 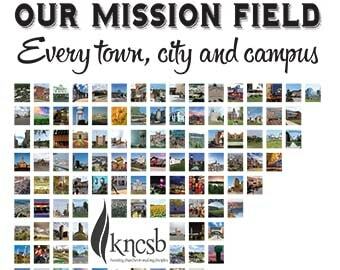 Send your news about Southern Baptist churches and associations in Nebraska and Kansas to Eva Wilson at the Kansas-Nebraska Convention of Southern Baptists. THIS SITE MAY CONTAIN TRANSLATIONS POWERED BY GOOGLE. GOOGLE DISCLAIMS ALL WARRANTIES RELATED TO THE TRANSLATIONS, EXPRESS OR IMPLIED, INCLUDING ANY WARRANTIES OF ACCURACY, RELIABILITY, AND ANY IMPLIED WARRANTIES OF MERCHANTABILITY, FITNESS FOR A PARTICULAR PURPOSE AND NONINFRINGEMENT. The KNCSB.org website may been translated for your convenience using translation software powered by Google Translate. Reasonable efforts have been made to provide an accurate translation, however, no automated translation is perfect nor is it intended to replace human translators. Translations are provided as a service to users of the KNCSB.org website, and are provided “as is.” No warranty of any kind, either expressed or implied, is made as to the accuracy, reliability, or correctness of any translations made from English into any other language. Some content (such as images, videos, Flash, etc.) may not be accurately translated due to the limitations of the translation software. The official text is the English version of the website. Any discrepancies or differences created in the translation are not binding and have no legal effect for compliance or enforcement purposes. If any questions arise related to the accuracy of the information contained in the translated website, please refer to the English version of the website which is the official version.